They are completely different, and at the same time they can teach each other a lot and find a perfect balance. Capricorn is by nature suspicious. Being a realist, he believes in what can be seen and touched, and doubts everything else. Capricorn will do everything in his power to protect himself from disappointments, and neglects such feelings as intuition and imagination leading him into a dangerous uncharted world. At the first signal of danger, Capricorn surrounds himself with barriers. Face to face with the sincerity of the child-Pisces, Capricorn can not recover from the shock: how do the Pisces dare to openly state their feelings? However, ice in the soul of Capricorn begins to melt, it awakens his own desires, hopes and dreams, which he so long tried to forget. And at the same time, Capricorn knows how to say "no", to achieve one’s own and to keep on firm ground - and all these qualities will try to adopt the Pisces. Because Pisces is extremely susceptible, this process will pass painlessly. Mom-Capricorn externally calm, but she knows exactly what she wants. It is decisive and purposeful - it’s not dormant Fish, which is set to sail along the course of life without special ambitions and hopes for wealth. The mother likes to surround herself with things that are, as it were, symbols of her well-being, but the Pisces is almost devoid of material interest. The mother likes to organize her life carefully - so that everything is in place and under her control. Well, Pisces prefers a free life style, which enables her to easily move from one occupation to another. She does not tolerate any framework, and her mother-Capricorn better not expect that her child will easily obey the strict order. Probably, the mother will consider the Fish completely impractical, but in the nature of the mother herself there is a trait that will help her to understand the dreamy, creative nature of the little Pisces. Capricorn also loves music and art, although it does not always show it. So she will definitely support the interests of Pisces in this area. Of course, she will try in every possible way to warn her child about the difficulties associated with the creative profession, but she will not hold back. 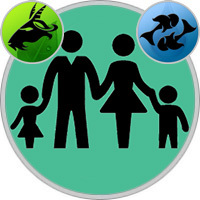 True, it is worth the Pisces to make your choice, as the mother will immediately begin to put pressure on her, because the vain Capricorn needs outstanding success! But if the Capricorn mom overdo it. Fish can throw everything, because it’s much easier to go with the flow... Pisces is afraid of failures, and besides, she does not want to upset her mother! She is frightened by any scenes, and she will diligently avoid confrontation. Capricorn is not the warmest of the signs of the zodiac, because they are ruled by the cold Saturn, and therefore it can be difficult for a mother to show her love, and this sensitive and emotional Pisces needs a lot - the more, the better. Capricorn can live in such a way that everyone respects him. Of course, he hoped that his child would be a worthy continuation of his father, but the little Pisces seems so strange... She does not have paternal logic, she lives mostly with dreams, constantly listens to her feelings and even frightens her father with a living imagination. She does not seem to appreciate what is so dear to him, a comfortable home, a family, a quiet life. Instead, she dreams of some kind of wandering around the world, about finding adventures and, apparently, does not want any bonds at all. Father would prefer to see her in a respectable house among expensive things, that is, a respected person with a position in society. He can not understand why it all seems wrong to her? Youthful years can become for Pisces that difficult time when the father in open will face her self-will. He will be surprised by her sharp reaction to all his demands, sadly recalling the times when his little Pisces tried to please him and gladly accepted everything that was accepted at home… She simply did not think about her personal desires and so wanted everyone of good! If now both look at everything from the position of common sense, maybe. Capricorn will be able to help Pisces tame his own self-will and teach her to avoid too much trouble. Perhaps, Pisces will show less willingness to agree than her father, but he must understand that most often it comes from self-doubt. Here she will need the support of her father. One way to keep her on the right track is to praise her often. True, it does not always happen… Well, can a reserved and thrifty Capricorn praise the Pisces for being too easy to spend money? But she is so generous! Life never appears to her in black and white, as it does with Capricorn. For the Fish, it consists of all the colors of the rainbow! And when the father understands this, it will be possible to open a new page in their relationship.